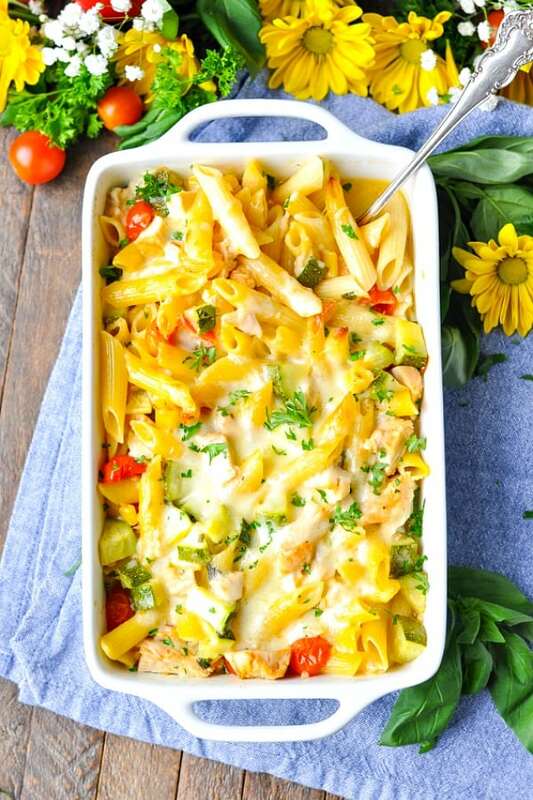 This Dump-and-Bake Summer Pasta with Corn, Zucchini, Tomatoes, and Chicken is a quick, light, and easy dinner that your family will love. 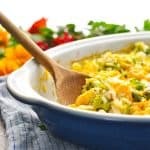 I think that I managed to pack all of the season’s best fresh veggies and herbs into one cheesy casserole! 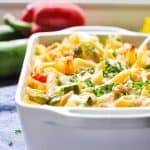 This Dump-and-Bake Summer Pasta with Zucchini, Corn, Tomatoes, and Chicken is a quick, light, and easy dinner that your family will love. It’s so simple and so fast because you don’t even have to boil the pasta! 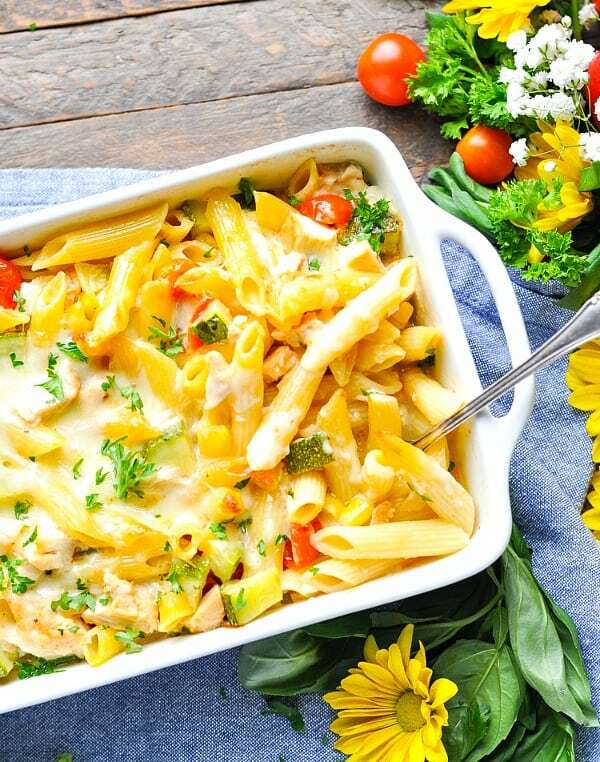 Just stir the ingredients together in one dish and pop it in the oven! But wait! Before you run off and assume that this is a heavy, calorie-laden meal that won’t jive with your bathing suit goals, hear me out! 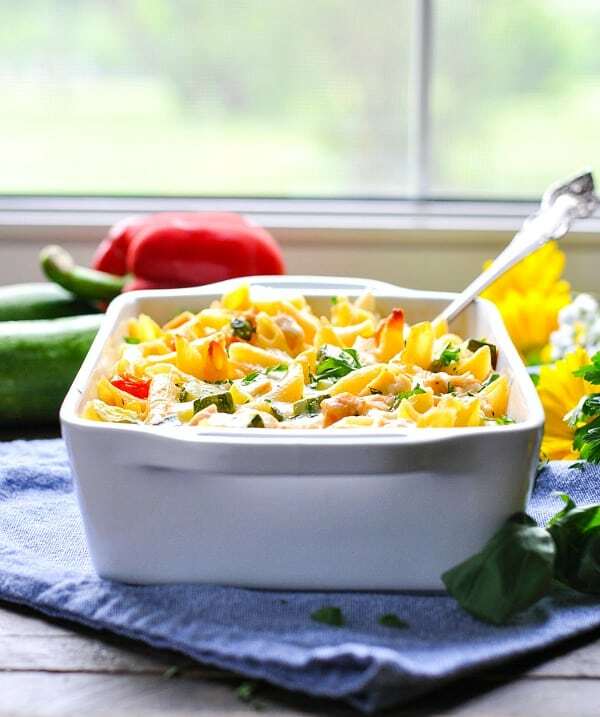 I’ve lightened up the dish with loads of fresh vegetables, lean protein, and a broth-based sauce for a dump-and-run summer pasta that has less than 300 calories per serving! Over the past 7 or 8 years, I have found that the best way to encourage all of my boys to eat their veggies is to add the nutritious stuff to familiar meals that the kids already know and love. 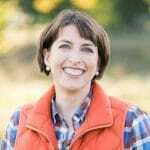 I’m not “disguising” or “hiding” the vegetables, but instead making them more palatable and mild by combining them with the flavors and textures that the boys enjoy. So when you’re faced with a garden full of zucchini, fresh tomatoes from the farmer’s market, or leftover grilled chicken from your recent cookout, there’s no need to force-feed a grilled chicken salad to your toddler! 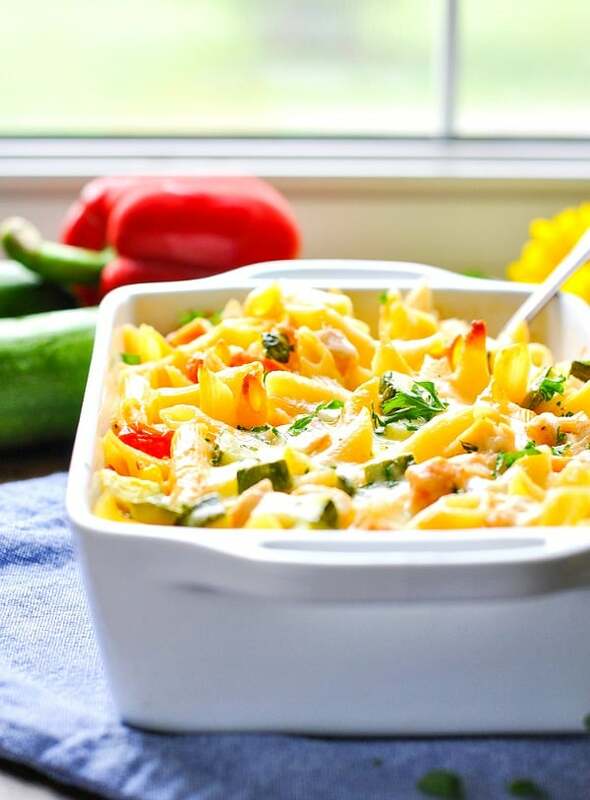 Instead, you can bake a fresh and light summer pasta with zucchini for an easy dinner that comes together in a matter of minutes (and it just happens to include zucchini). This is about as easy as cooking gets, since you don’t even have to boil the pasta! Preheat oven to 425°F (220°C). Spray a 9 x 13-inch baking dish with cooking spray. 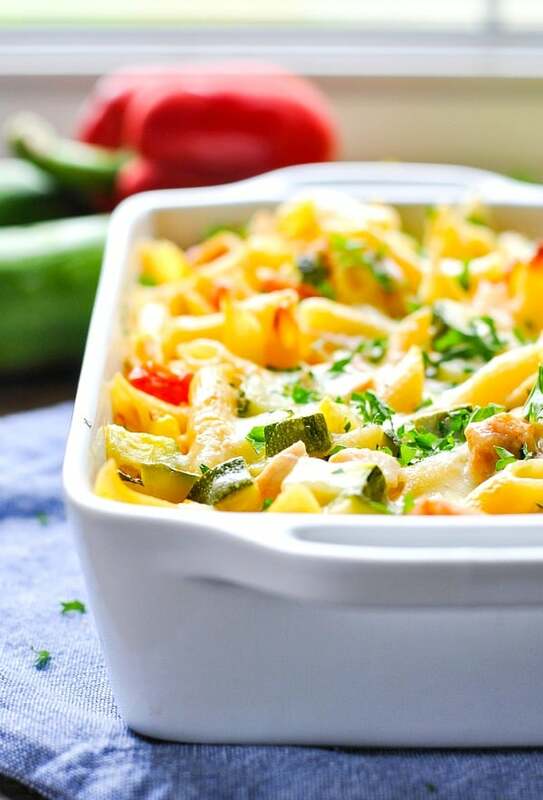 In the prepared dish (or in a separate bowl), stir together cooked chicken, tomatoes, zucchini, corn, uncooked pasta, chicken broth, 1 ½ cups of mozzarella cheese, about half of the basil leaves, minced garlic, and salt. Cooking Just for Two? 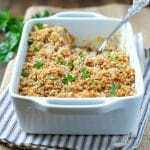 You can prepare a much smaller casserole by dividing the ingredients in half and baking the dish in an 8-inch square pan. The cooking process remains the same. Want to Prep Ahead? You can dice the chicken and vegetables in advance. When you're ready to prepare dinner, just stir the ingredients together and bake! What a pretty pasta, Blair! I love how you combined fresh produce and comfort food. 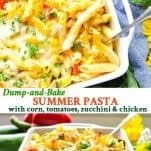 You’re so right…summer doesn’t mean giving up comfort foods, and this looks like the perfect dish. I love all of your dump and bake meals! My family has loved all of the other Dump-and-Bake dishes that I’ve made, and it seems like you guys have too! What’s not to love, right? You don’t even have to boil the pasta or prep any ingredients, and the noodles come out tender and perfect every time! Thanks, Brenda! I hope that you have a chance to try it! Yum, my whole family loved this, and my college age son asked me to put it in the recipe pile he is taking back to school next month. I used elbow macaroni, which is what I had. Next time, I think I will double the zucchini (or add a yellow squash). I also used fresh rosemary in lieu of basil, because again that’s what I had on hand. It was really delicious and very easy. Thanks! 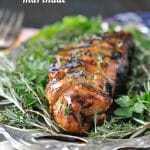 Hi Blair: I made this dish for dinner last night, and it was FANTABULOUS! I used Whole Grain Penne Rigate’, and I also added in an 8 oz. can of (drained) mushroom stems & pieces,, since my family loves mushrooms. I served this dish with a tossed Italian salad, and I gotta tell ya….it received RAVE REVIEWS from my (fussy) family! It’s now on my ‘Rotation List’ . Thanks for yet another delicious recipe. 300 calories per serving is actually really impressing when it comes to a pasta dish. This will be a super dinner throughout the week! Has anyone tried no chicken? i’m wondering if i should just leave it out (vegetarian) , is there a type of bean you suggest? What a terrific use of fresh ingredients! Mind if I distribute copies at a Farmer’s Market? I will highlight your website so everyone will be able to find your page. That’s no problem. Thanks for checking, and thanks for sharing it with your friends! This was a hit Round our table and we’re making it for a second time already. Any thoughts on how well this would freeze after being baked? Awesome! I love that your family enjoyed it! Thanks for letting me know, Melissa! Wow, can’t wait to try it! Thanks for sharing this awesome recipe. 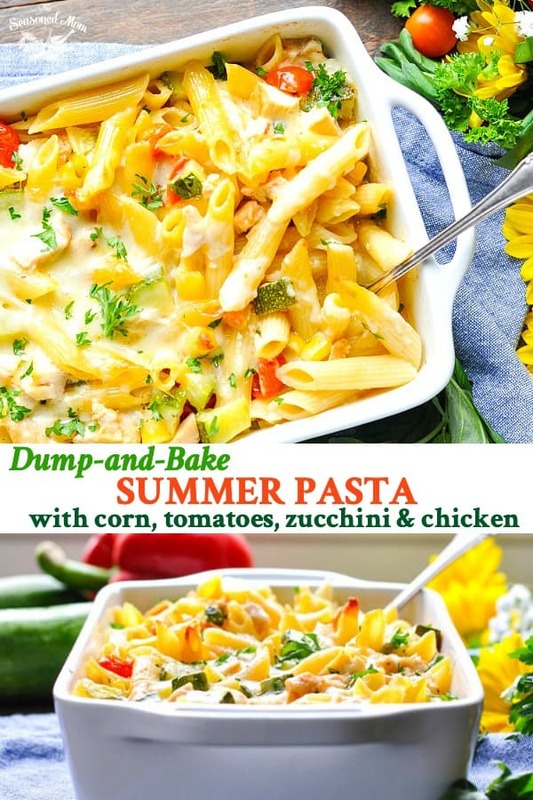 “Dump and Bake” is a great concept. I’m so glad that you enjoy them, Dorianne! I have many, many more similar dump and bake recipes coming soon! I admit I was a skeptic; would the pasta truly cook well, would it be watery, would it be bland. Oh, but there was no need to worry! This is an amazing dish I will be making again soon. And, the leftovers, I think will be good cold over salad greens, too. Very flavorful and easy. Love using my fresh veggies and herbs! Thanks! Is it supposed to turn out watery? Hi, Brittany! 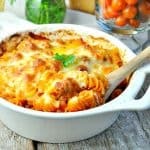 No, the pasta should absorb most of the liquid in the dish as it bakes in the oven. You want a little bit of thickened “sauce” in the dish so that it’s not too dry at the end, but it shouldn’t be soupy and watery. Sounds delicious! Do you think this would work as a freezer meal? Super good! 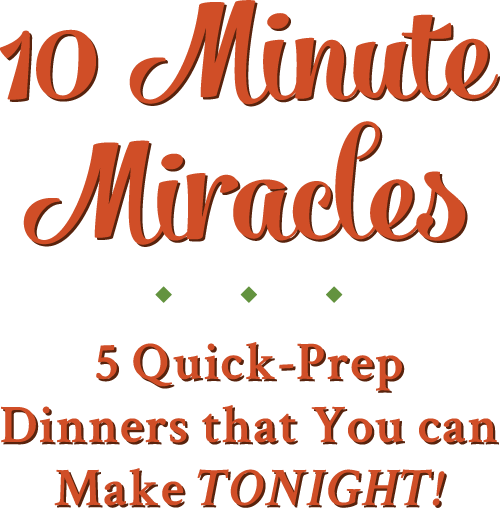 I’m always looking for recipes that are fairly easy to make, somewhat healthy and something the whole family will eat. This hit the jackpot and everyone asked for seconds. Next time I think add some more chicken broth because some pasta on the top weren’t submerged & didn’t cook. Other than that, it was terrific! Anyone try this in a crockpot? Hi, Cathy! No, I haven’t tried it in a slow cooker myself, but I bet it would work! You will just need to keep an eye on it so that the pasta doesn’t get overcooked if it’s in the pot too long. Turned out great and so yummy! My pasta took 55 minutes to cook through but I do live at 6,800’ Thanks for the easy recipe! Made this tonight. It was delicious! Will definitely be making it again!